It's now been about 2 months since I moved to montreal and just over 2 months since I left San Francisco to embark on the amazing journey that was Whuffaoke or Bust. This period has given me time to go through all the emotions related to making a big change like this. For me, it starts with excitement, then moves into 'WTF have I done? ', then shifts into a retrospective backlash (turning a bit of anger to my former situation) as I learn to really appreciate my new setting, then finally turns into settling in and really enjoying and discovering my new surroundings. The same thing happened to me when I first moved from Toronto to San Francisco over four years ago. It occurred to me that is pretty much the process of big life changes: new jobs, new relationships, ending of old relationships, political changes, shifts in philosophy, etc. Even when I've initiated the change, it's a struggle. When I haven't initiated the change, the second step (WTF) lingers a little longer. But once I've gotten to the end of the adjustment period, I've grown a great deal for it. Montreal is a beautiful city. The architecture is, by no means, as old as the cities in Europe, but has that old European flair. When wandering around Old Montreal (or Vieux Montreal), you really sense the early French settlers of this region. But Montreal is diverse. In the area I live in - The Plateau - there are rows of brownstone houses with treacherous staircases (I live up one of those), bay windows and large trees in front. The layouts are similar - long apartments with adjoined front rooms, usually separated by an archway or a set of French pocket doors a kitchen near the back with a terrasse off of it that overlooks a courtyard shared with neighbours and either a spare room or a storage room in the very back. The ceilings are high. The heating is radiators. The bathrooms are generally small and there is usually the original moulding left throughout. I've loved these brownstones since my first trip to Montreal in 1996. Now I live in one just like how I imagined it back then. There are two major streets - St. Denis and St. Laurent - that run through the 'bohemian' sections of the city - The Plateau, Mile-End and Outremont - with many secondary routes filled with boutiques, coffee houses, bars and amazing restaurants. Take any one of these side streets and keep walking. You'll be treated to another pocket of charm. There are also an amazing number of parks filled with people here. When it is not winter (and even a little chilly), Montrealers love to be outside. The parks are filled with music, dogs, children, art projects, laughter, food (so many picnics!) and people meditating or doing yoga. In my neighbourhood park, Parc LaFontaine, I've seen people walking their cats, iguanas and parrots as well. There is no shortage of music, art, festivals, craft fairs, street fairs or other public gathering here. But that's not it. One of the things I thought I'd be able to slow down a bit on here is the tech community events. Nope. Several times a week there is some sort of gathering of geeks of all sorts - and there ARE all sorts. Enterprise tech, startups, bloggers, podcasters, beer-loving geeks, social geeks, tech authors, coding groups...I've already missed more events than I can go to. Montreal has a fantastic and alive web scene and the people who are part of it are world-changers, frontier dwellers (Duncan Moore coined that one for me) and risk takers. They are excited, driven and supportive of one another in a way I haven't seen since I first arrived in San Francisco in 2005. It isn't that this is new for them - they've been gathering and working together like they do now since the first dot-com era - it's just that they understand that if they are to become the best they can be, they need to work with their friends to get there. It's awesome. Which leads me to my new perspective (which is really my old perspective). The other night, I was fortunate enough to speak at the Girl Geek Dinner in Ottawa and was asked some pretty awesome questions. One of those questions was the question I get asked most often: "Why did you move back to Canada when there is all this opportunity in the US?" My answer to this has evolved since I've been here. First off, it was just that I needed a change and thought I could bring what I've learnt back to Canada. But now, I realize that I moved back to Canada, and specifically Montreal, because I needed a new perspective. 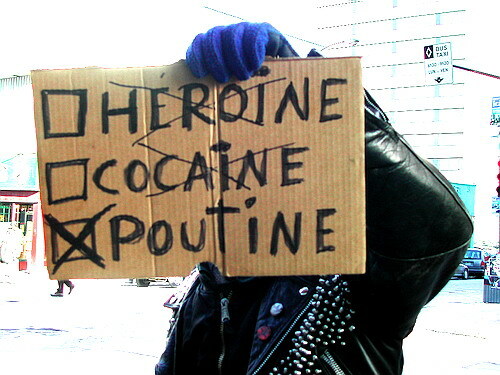 It's hard to put your finger on it, but Canadians are quite different from Americans. (I realize this is a generalization of course, but it's my experience). Not better or worse, but different. As a country, we are more conservative...not socially or even fiscally...but conservative as in cautious. This can be frustrating for many of the entrepreneurial types that live in Canada, which is why go-getters are attracted to move to the US. The US risk-taking index is way high. What I find most interesting about this is the odds are actually worse for Americans. You quit your job and start a company and fail, you have no real social system to fall back on so you could end up losing everything. In Canada, you have an awesome social system that cushions any fall, so it should be more attractive to take risks here. Right? Well, that doesn't seem to be the case and I hardly have the answer as to why, but I suspect it has something to do with the 'land of opportunity' brand that the US has adopted and that Alain De Botton talks about in his book Status Anxiety. In the land of opportunity, if you haven't "gone for it", you're squandering your opportunity. Canada's brand is different and not a brand really promoted by its citizens at the same level. Canada is seen as the nice place. A country filled with helpful, friendly, smiling, welcoming people. The type of country that puts individual gain aside for the good of the group. I actually love this part of being a Canadian. Over the years, we've definitely seen gains in the export of Canadian ideas, products and goods and a good number of successful businesses, but there seems to be a distinct humility around success. A Canadian business didn't 'do it themselves on their own merit' but with a supportive community, a strong staff and a bunch of lucky breaks. We all continue to support our businesses who take this outlook and grow distasteful of businesses who become too upity. But I do believe the brand of Canada could grow in the direction of 'risk is welcome here'. And rather than becoming more 'American' - not a bad thing, but just doesn't suit the Canadian brand - we could learn to leverage that niceness as the perfect opportunity to grow our entrepreneurial base and use the support of the community and government to help grow those businesses to become examples for other budding entrepreneurs. Montreal, beyond being a fantastic city in Canada, also reminds me that balance leads to success. That spending time in the park with friends, my dog and my mental state is good for opening my thought process. That long, slow meals are better for my health, which is also better for my growth. That spending time listening to live music and visiting art installations help me think more creatively about my work. Montrealers aren't generally in a rush. They 'promenade' instead of power walk between destinations. There is a distinct lack of fast food and the lineups are at the restaurants that encourage 4 hour sittings. The process of thinking things through is much more important than coming to a solid conclusion. Talk about a new perspective! I've already thought much deeper, taken more time to ask questions (rather than come to my own conclusions), stopped being so defensive and learnt to practice what I preach: stop and look introspectively to figure out where my own biases are blocking my ability to grow. In the end, balance isn't about work/life or even priorities, balance is about finding your own rhythm. This is something ostensibly inherent to Montreal life. Being generous and community focused while balancing personal needs (saying no and having people really respect that, for example). Being unapologetic for taking care of personal needs instead of sweating over a deadline - this coming from an understanding that the deadline is less important than doing the job correctly. Approaching feedback with less defensiveness and more thoughtfulness. My Montreal colleagues are incredibly open people who will push back with passion and not defensiveness (I have much to learn here). In under two months, I've stopped being so stressed, I feel less obligation, more ready to work on what's important rather than what I need to do to prove myself. I'm also less defensive, more open to feedback, happier, healthier and Shel Israel, who recently came to town, commented on how much younger I appear (not sure if that's true, but I'm definitely feeling it). I am definitely thinking more clearly about how I need to approach my next book and my next phase of work, I have significantly eased up on being hard on myself and instead of feeling lonely, I am treasuring any time I have alone. My son and my dog are both signficantly happier. Tad is loving his new school and thriving (I seriously treasure the public education system here in Canada). He has a nice new group of friends and has focused on his music again. Ridley loves the number of parks here filled with squirrels and seems more relaxed (if that's possible for a pug) than ever. His coat is consistently healthy. I love my new apartment and new neighbourhood. There is so much to explore just within a 1 km radius that I haven't had time to explore beyond yet. The restaurants will be my downfall as will poutine (fries with gravy and cheese curds..mmmm). But I'm also surrounded by amazing fresh local markets filled with good, healthy food and have been spending more time cooking again. It's hard to assess after less than 2 months what these changes will bring, but everyday, I feel a little more myself. I feel excited about my work again. I am learning French and feeling like I'm growing again. I'm smiling like crazy, even when I'm on my own. I feel incredibly fortunate and blessed to be here right now. My new perspective feels a lot like my old perspective. The one I had when I arrived in SF in 2005. There wasn't an 'industry' or even a 'community', but there was tonnes of possibility and excitement. Nobody had to prove themselves...we were still trying to figure out how all of this fit together. We spent zero time convincing others that we were "experts" and 100% of the time sharing what we were discovering about the changing landscape around us. And we were still cautious to claim any major generalized victory even when we saw strong examples. That's how I'm seeing the world again. As complex. As changing. As challenging. And as full of possibility. A huge 'Merçi!' to my new friends in Montreal for being so welcoming and to my old friends in SF, Toronto and Calgary (places I've lived) for your love and support.